Was it a new dance? A mime? Or perhaps sheer madness. That’s what Anna Cardy thought when she entered her sister’s bedroom and found her, silent and repeatedly jabbing into the air. Fashion, it seems, has entered a new dimension. 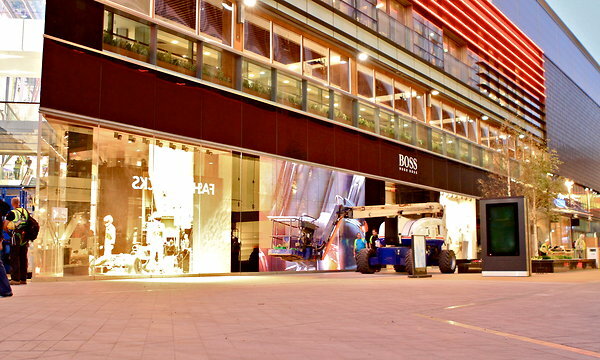 The Hugo Boss store at Westfield Stratford City, the largest shopping center in Britain, which opened this month near the 2012 London Olympics site, features an 8-meter, or 26-foot, media wall that allows customers to “dress” onscreen models who respond to consumers’ movements by looking at them, moving towards them and walking alongside them. In April, Burberry celebrated its Beijing store opening with an AR catwalk show in which holographic Burberry-clad models appeared to walk among the live models. Meanwhile, there is more to the T-shirts produced by the London fashion label Cassette Playa than meets the eye. When seen through a Webcam, an AR code on the T-shirt is activated to reveal, for example, horns growing from the wearer’s head. As are the opportunities within fashion retail. The definition of AR is broad: “It’s a blanket term for augmenting the real world with digital information,” explains Matthew Szymczyk, chief executive of Zugara, the Los Angeles-based software company behind Banana Flame’s AR shopping tool. AR involves a live video feed. It can be controlled by gestures; it sometimes uses facial recognition; and is often in three dimensions. Last year, for example, Adidas introduced the Originals AR Game Pack, sneakers featuring an AR code on the tongue. When held up to a Webcam, owners were taken to interactive games online. Fashion magazines like Dazed & Confused, Tatler, InStyle and GQ have included AR codes in their print issues. When codes are shown to a Webcam, “the pages come alive on your screen, as a fashion film is superimposed on the magazine image,” says Rod Stanley, editor of Dazed & Confused, describing an AR feature in his magazine. For Dazed & Confused, the idea was a success: “Thousands viewed the films, plus it was discussed a lot. It reaffirmed our reputation as innovators,” Mr. Stanley says. Existing examples of “try before you buy” include Ebay’s “See It On” app, enabling shoppers to fit sunglasses to their faces via an iPhone 4. Shiseido’s Magic Mirror, now touring British department stores, is an AR-facilitated make-up simulator that allows shoppers to test products without being smeared with unsuitable makeup. And the fine jeweler Boucheron invites prospective shoppers to download a coded image of a wristband from its Web site. Once the image is printed, cut out and held to a Webcam, it reveals, say, a bracelet worth six figures around the user’s wrist. Earlier this year, the Financial Times reported that the AR market for handheld devices in the United States alone was predicted to grow to $350 million by 2014, from $6 million in 2008. With more developments like Banana Flame’s, could fashion consumers be finally confident of fit when buying online? Mr. Szymczyk notes that e-commerce generally sees disappointing sales. Today, around 2 percent to 3 percent of all browsers actually buy something, compared to 20 percent to 40 percent offline, while online return rates are abnormally high at 25 percent to 40 percent. “What if customers could have the ‘at the rack’ experience online?” he asks. So the race is on to perfect the virtual changing room. For example, NG Connect’s Virtual Personal Stylist uses a scanning booth to create an avatar whose proportions match those of the user, while MyBestfit, a size-matching kiosk for jeans now at the King of Prussia shopping mall in Pennsylvania and rolling out across the United States, scans a body across 200,000 points with low-power radio waves. The shopper’s body details then can be used online or in-store with participating brands. But it is debatable whether AR can achieve perfect fit. Indeed, Miss Cardy admits that her new purchase did not quite look as she expected: “The image wasn’t that realistic, and it can’t give an accurate fit.” However, it was useful, she said, to see the color against her skin and check that the style suited her. Since adding the tool in August, the number of unique visitors who put something in their carts has increased 182 percent over last year’s totals. He says the technology is inexpensive and dependent on visitor numbers — a million would cost “four figures,” in British pounds. At least, then, AR can suggest what clothes would look like or, even, what clothes shopping might resemble in the future. Much now is about gimmickry and buzz. It’s this perceived excitement that, argues the San Francisco-based futurist writer Jamais Cascio, causes a “hype cycle,” which he describes as a peak of inflated expectations that leads to a trough of disillusionment and eventually levels off at a plateau of profitability. Fleur Britten is an editor at The Sunday Times of London.